- Bloomington Gold certified, NCRS Top Flights (multiple), - NCRS PV'd (Performance Verified), Bloomington Gold Special Collection (1985-1988-1992). Documented with the warranty book/P.O.P., original title, owner history, DeLorenzo letter of authenticity, race grids and race results, Watkins Glen 500 August 1967 program, invitation to the "Special Collection", Special Collection booklets (scans), judging certificates from NCRS and Bloomington, certificate of authenticity from Franklin Mint, and multiple 3-ring binders!!! 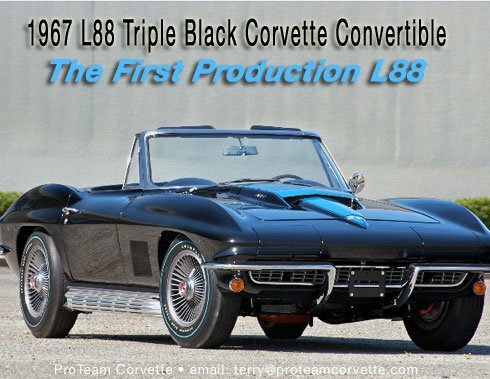 This Tuxedo Black convertible is certainly one of the most photographed L88 Corvettes and has been editorialized in: Corvette - A Piece of of the Action, The GM publication Corvette News, Registry of Corvette Race Cars, Corvette Racing Legends, The Best of Corvette News, Corvette An American Legend, Old Cars Weekly, Hemmings Muscle Machines, Corvette Magazine, Corvette & Chevy Magazine, Corvette Fever magazine, Automobile Quarterly's Quatre Foil magazine, Zip Products 1985 catalog, Franklin Mint's Precision Models, Birmingham Eccentric August 1968, and a host of other publications and websites. One of the most historically significant L88s in existence and has been owned by the who's who of the car collectors and now resides in ProTeam's Personal Reserve Collection.